Collection is easy, just put in sim n can use directly. Signal is strong. One of the first things you will need to think about when planning a vacation to a foreign country is how you will stay in touch with friends, make brookings on the spot, call a taxi, contact your tour operator and so on. 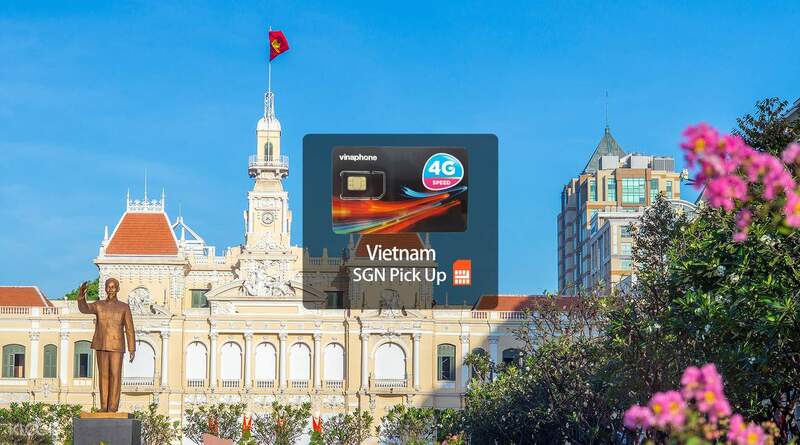 With the 3G/4G SIM Card (SGN Pick Up) for Vietnam, You will be able to pick up a local SIM card right upon your arrival at the airport. Don't waste any time trying to find a local operator in the city or go over your budget with international calls. With the 3G or 4G local SIM card, you will be able to get in touch with your driver, hotel or let your family know that you've arrived safely right there and then. Choose from several packages to suit your needs and enjoy up to 2GB data coverage per day. Highly recommendable especially if you are staying for more than 15 days in HCMC or other cities of Vietnam. Mobile data is fast and reliable. We were able to roam around the city by just using the internet. Highly recommendable especially if you are staying for more than 15 days in HCMC or other cities of Vietnam. Mobile data is fast and reliable. We were able to roam around the city by just using the internet. Very helpful simcard when you are traveling in Vietnam. Location is easy to find at airport’s arrival in Vietnam. You will just have to present your voucher and they will give you right away your simcard. I choose 5gb data for my 5days stay in Vietnam and its very fast and reliable whenever I want to stay connected. Highly recommended! Very helpful simcard when you are traveling in Vietnam. Location is easy to find at airport’s arrival in Vietnam. You will just have to present your voucher and they will give you right away your simcard. I choose 5gb data for my 5days stay in Vietnam and its very fast and reliable whenever I want to stay connected. Highly recommended! I preferred to pick it up in the airport and its very convenient. As soon as I placed it in my mobile, its good to go. No problems so far. Fast and reliable. You could go online and post everywhere you want! I preferred to pick it up in the airport and its very convenient. As soon as I placed it in my mobile, its good to go. No problems so far. Fast and reliable. You could go online and post everywhere you want! I booked a trip and Vinh was my bike rider. He is a working student who is industrious and passionate on what he do. More than the tour, he told me about a brief background of the influence of Chinese, French and Americans to Vietnam. This is something I very much treasure because it gave me knowledge about Viet culture and behavior. I recommend this tour because you not only see Saigon on a different angle (night), away from heat and traffic, but will give you cultural knowledge of the people. I booked a trip and Vinh was my bike rider. He is a working student who is industrious and passionate on what he do. More than the tour, he told me about a brief background of the influence of Chinese, French and Americans to Vietnam. This is something I very much treasure because it gave me knowledge about Viet culture and behavior. I recommend this tour because you not only see Saigon on a different angle (night), away from heat and traffic, but will give you cultural knowledge of the people. Very helpful simcard traveling around Vietnam. The internet is fast and reliable, I'm always connected. Thank you klook. Very helpful simcard traveling around Vietnam. The internet is fast and reliable, I'm always connected. Thank you klook. I am so glad that I availed this sim card. I can always have internet connection everywhere I am. It is so fast and efficient. I am so glad that I availed this sim card. I can always have internet connection everywhere I am. It is so fast and efficient. Collection counter is easy to locate. Quick redemption within 5mins. Good coverage with fast speed. Very useful for traveller to navigate around the city. Collection counter is easy to locate. Quick redemption within 5mins. Good coverage with fast speed. Very useful for traveller to navigate around the city.